Be the first to share your favorite memory, photo or story of Maria . This memorial page is dedicated for family, friends and future generations to celebrate the life of their loved one. 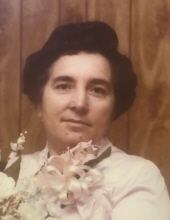 Maria Da Gloria Martins Batista, 86, passed away at the Vitas Hospice in Wayne, NJ on Tuesday, February 5, 2019. She was born in Freixo da Serra, Gouveia, Portugal and came to the United States in August of 1969 and resided in the Ironbound Section of Newark. Maria Da Gloria worked for Ideal Toy Co. of Newark for many years. Beloved wife of 63 years of Albino Batista; devoted and loving mother of Antonio Batista and his wife Maria, and Alzira Santos; dear sister of Ana Almeida and her husband Jose; Aida Oliveira, and Isabel Santos and her husband Agostinho of France; cherished grandmother of Isabel Silva, Nicole Batista and Ashley Batista; great grandmother of Natalie Silva. The Funeral for Maria Da Gloria will be on Saturday, February 9, 2019, at 8:30 am at the Buyus Funeral Home at 426 Lafayette Street (at Wilson Ave.), Newark, NJ. Thence to Our Lady of Fatima Church, Newark, where at 9:30 am the Funeral Mass will be offered. Interment to follow at Holy Cross Cemetery, North Arlington, NJ. Relatives and friends are welcome to attend. The visitation for Maria will be on Friday, February 8th from 6 -9 pm. In lieu of flowers, donations to the Alzheimer’s Association www.alz.org would be graciously appreciated. To send flowers or a remembrance gift to the family of Maria Da Gloria Batista, please visit our Tribute Store. "Email Address" would like to share the life celebration of Maria Da Gloria Batista. Click on the "link" to go to share a favorite memory or leave a condolence message for the family.